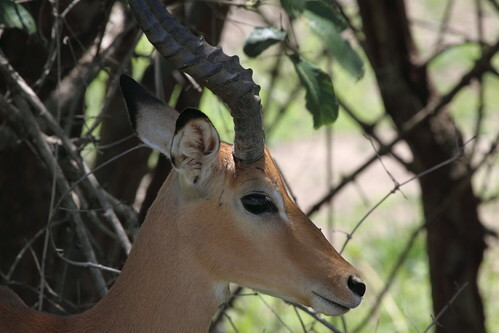 After a few days in South Luangwa National Park we headed back to Lusaka and then on to Kafue National Park. The trip out to Lusaka was not without its drama. 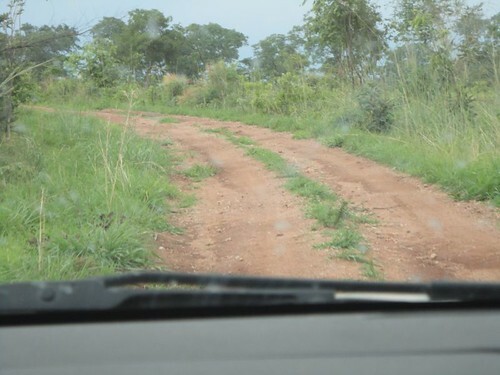 We spent 4 hours on a (good) dirt road and then when we got to the tarmac and picked up a bit of speed we noticed that the car was vibrating quite dramatically. We stopped at the first town and pulled into the service station. Gorgeous Man got out and looked under the car to see if anything was broken. There was nothing we could see. So we phoned the hire company. I have to give a shout out to Hemmingways our car hire company. Gorgeous Man spoke to the owner who thought that it was probably just the wheels unbalanced. 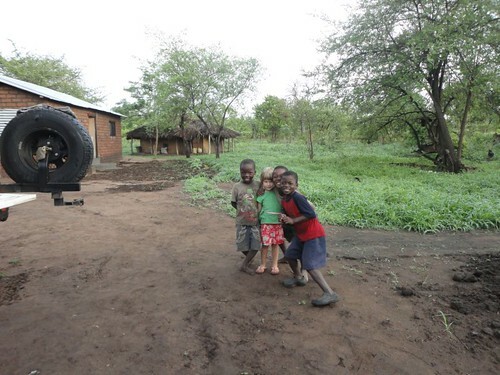 He arranged to meet us in Lusaka the next day and we drove to a mechanics and had the wheels rebalanced mid-trip. We were very impressed with their customer service and support. 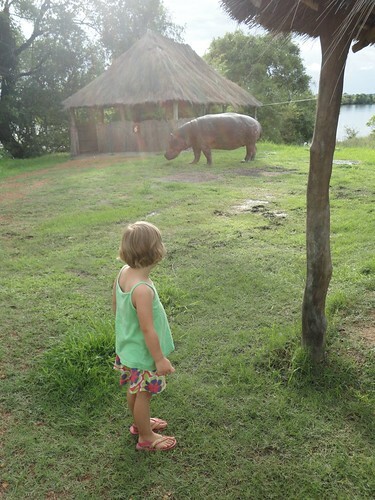 We stayed at Mukambi Lodge near Kafue National Park. 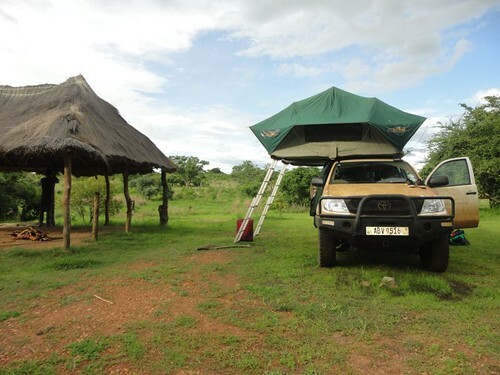 The chalets were a little out of our price range and so we camped in the camping area and then took advantage of the drive and boat safaris that the lodge offered. This meant that we did not have to pack up everything we owned every time we wanted to drive somewhere. Note the new colour of the car… Each camp site gets a shade shelter. Most people pitched their tents underneath, but ours was too high, so we used it for eating and cooking. 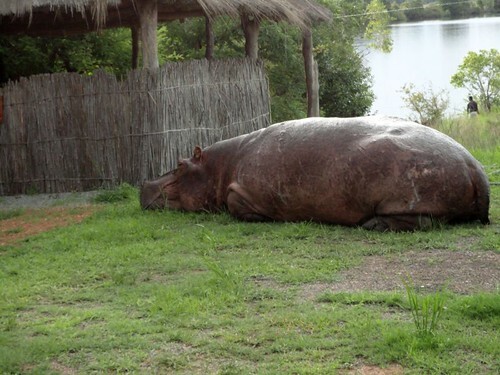 Hippos are herd animals, but for some reason there is a local hippopotamus who has been banished from the herd. 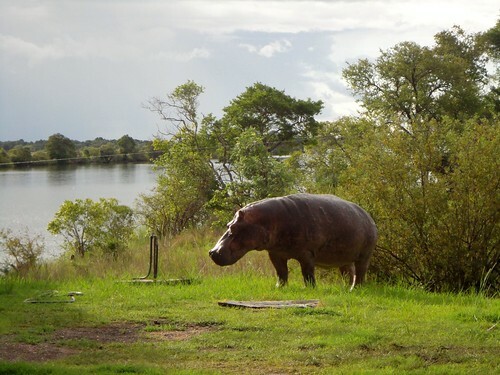 We had been told about Basil, the friendless hippo who has adopted the lodge as his herd, and we hoped to see him while we were there. As we were setting up our tent the first night I heard Gorgeous Girl say “Hippo!” and I turned and saw this. He had climbed up the bank and wandered into the camping area. As you can see he was quite close. But completely unconcerned and uninterested in us. After eating a bit of grass, he made himself quite at home. So cat came out to have a look. It was a very special start to our visit. (We fly to Papua New Guinea tomorrow. I’m not sure how long it will take to arrange internet access, so I may be missing for a few days). After a good night sleep we headed for the South Luangwa National Park. 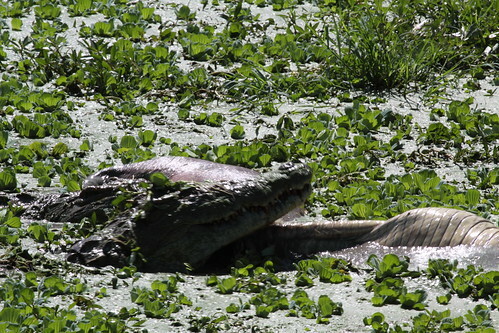 One of the first things we saw was a group of crocodiles feeding in a lagoon. 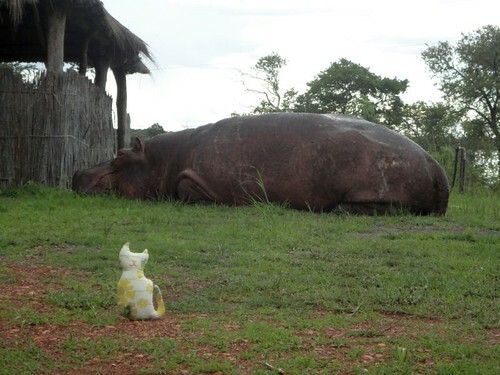 This is a dead baby hippo. We have been told that crocodiles do not usually attack hippos and so it is most likely that the baby was dead before the crocodiles began to eat it. There was a large group of them and they were grabbing and rolling the hippo in the water to try and tear chunks off. We did see some more conventional animals. 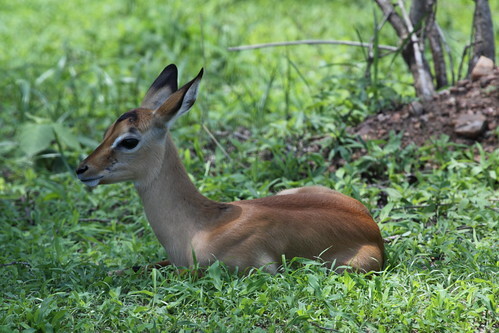 This beautiful creature is called a Puku. 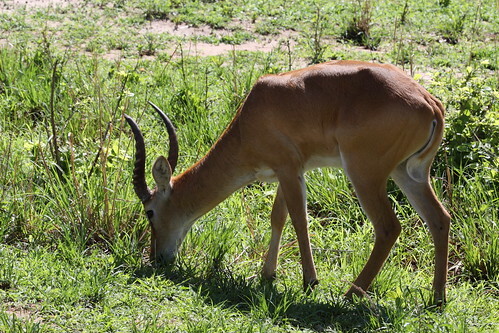 They are similar to an impala, but not quite so finely boned. I should say that Gorgeous Man got a fancy new camera lens for Christmas (early Christmas present so he could use it in Zambia) and a lot of the photos in this post were taken by him. 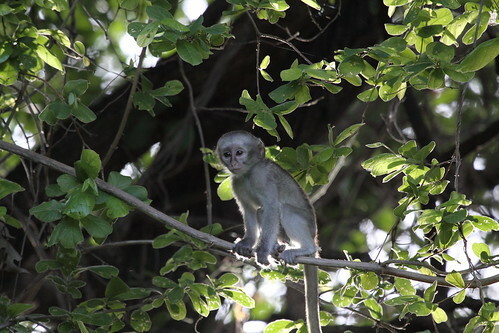 Because it was the wet season there were a lot of babies around. 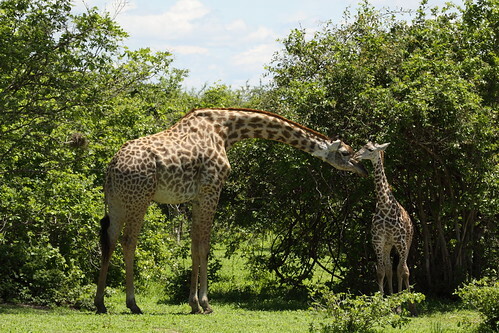 These giraffes are Thornicroft giraffes. They only occur in this area and they are very, very pretty. These were my favourite animal of the trip. 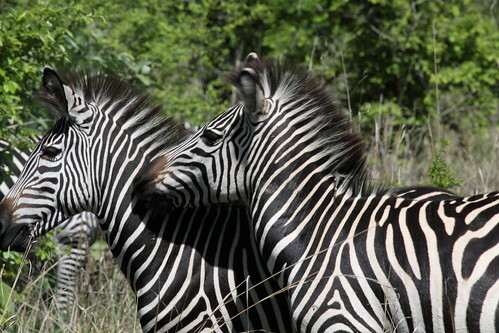 The zebra were also a sub-species that was much more heavily striped than those found in South Africa. We did see baby zebra, but they were really hard to photograph. 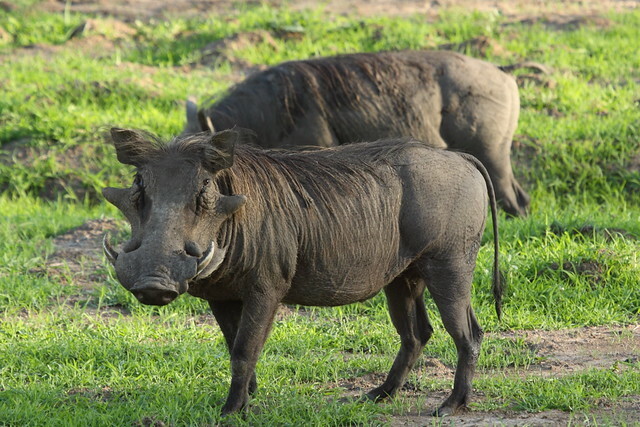 One of our favourite creatures is the warthog. When they run their tails stick straight up and it is very comical. Of all the animals we saw that day, the buffalo make me the most nervous. 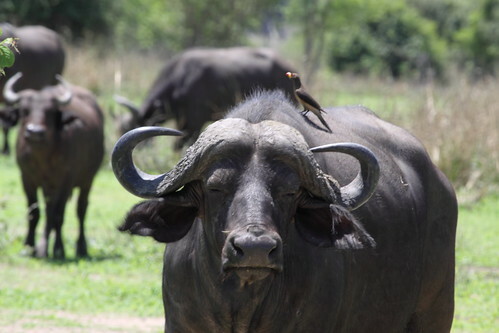 The other big animals tend to ignore the car, but buffalo will stop and stare you down. 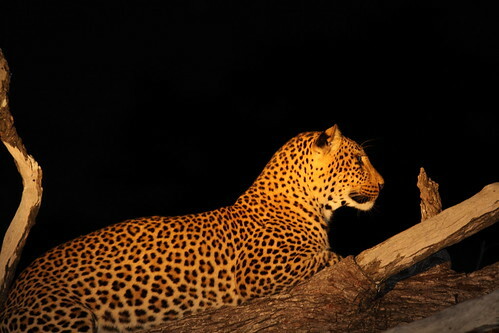 One highlight of the park was taking a night drive in one of the lodge’s safari vehicles. You cannot self-drive at night and so must use a guide and their vehicle. We were very lucky and saw this. In non-Zambian trip related news. After 2 months of hanging out in Australia and bunking with various friends and relatives our passports have been returned to us with our entry visas for Papua New Guinea glued in. We hope to be heading up there sometime this week. After a somewhat sleepless night we rose bright and early to continue on our way. We were only 50 kilometres from the lodge that we were headed to but we knew it would take several hours. Two of the young boys (about 15) from the village came with us. We all drove in the car until we came to the river. Then we headed off road. 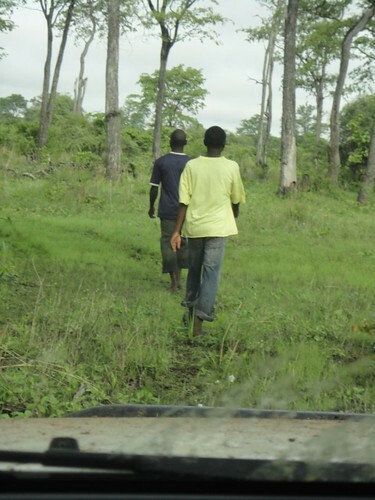 The two young lads walked in front of the car searching for a new place to cross the river. (Yes that is the bonnet of the car at the base of the picture). Periodically Gorgeous Man would get out of the car and walk with them scouting for the best path to take. He still managed to find time to bring Gorgeous Girl this fantastic creature to look at. 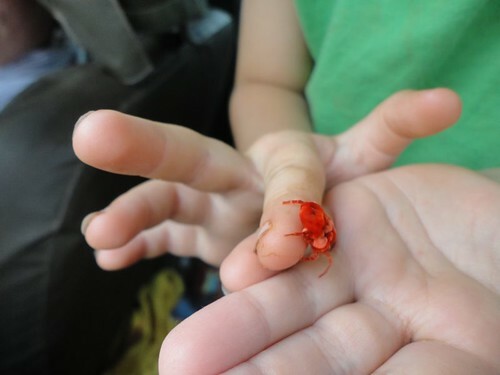 It’s a velvet mite. It had a velvet like skin – hence the name. 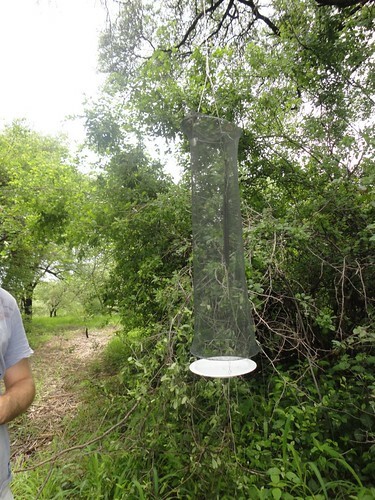 It was probably the coolest bug we saw all trip. Eventually we came to a place where the water had not yet come to. 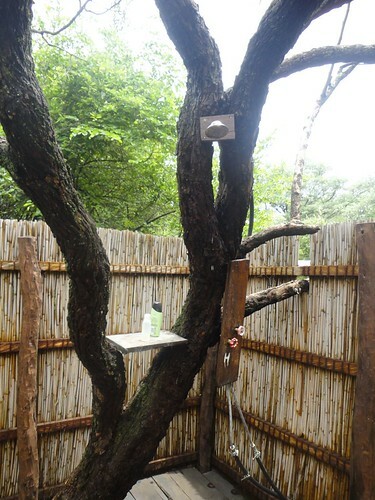 It had been used the night before by elephants. 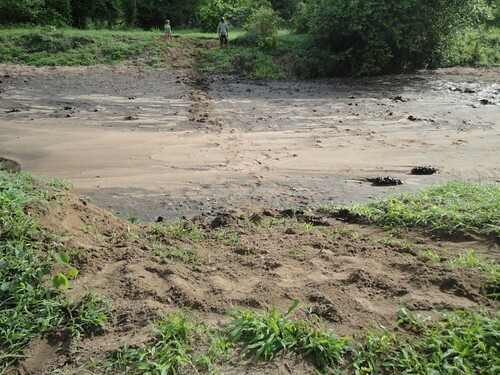 The two large mounds on the right of the river bank (towards the bottom of the photo) are fresh elephant dung. Gorgeous Man and the two boys levelled out the sides of the bank with a shovel (the hire vehicle came equipped with jack, tow rope, shovel etc) and then Gorgeous Man drove across. Then we all drove until we rejoined the road. I thought that this would be an easier part of our journey, but the young men told us that there was another washed out crossing that was very bad and they would accompany us to that as well. We continued onwards. 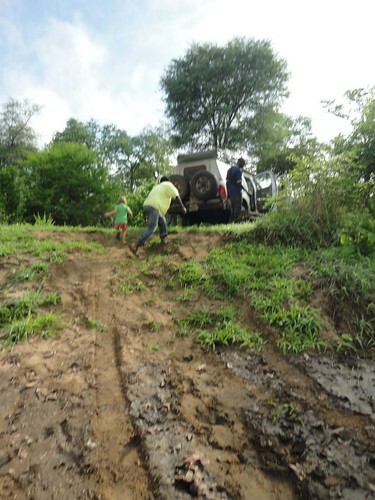 We did get stuck in the mud once, but some fallen branches placed under the tires soon got us out of that mud puddle. When we got to the river crossing that had been washed, away we were pleased to see that with the redistribution of some rocks and stones it would be passable. We said our very grateful goodbyes to our two guardian angels and continued on our journey. Not long after the second river crossing we encountered good graded road again. We were blessed to see the first elephants of the trip, much to Gorgeous Girl’s delight as this was her first elephant sighting. There was great excitement on Gorgeous Man’s part as well when I spotted this bird out of the window. 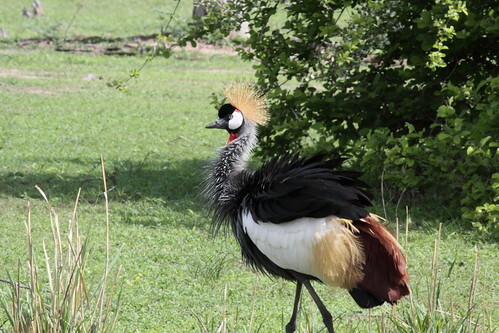 This is a crowned crane and has been on Gorgeous Man’s life list for some time (he is a keen birdwatcher). They are huge and truly magnificent birds. Just before mid-day we reached our destination. It had taken 5 hours to go 50 kilometres. When the workers at the lodge heard which road we had taken their eyebrows raised and they said “And you got through? 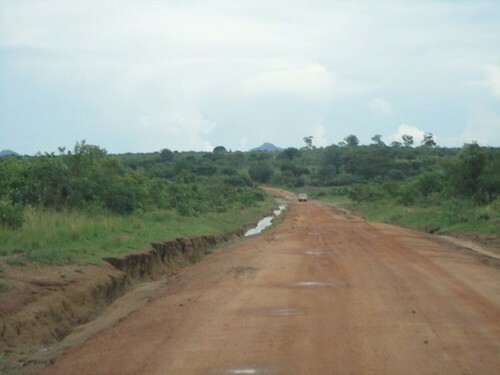 !” Seems we had been very lucky, as this was a dry season only road and we were just at the beginning of the wet season. We booked ourselves into a cabin, had a shower and retreated to the restaurant for a cool drink. Gorgeous Girl’s cat came along with us. 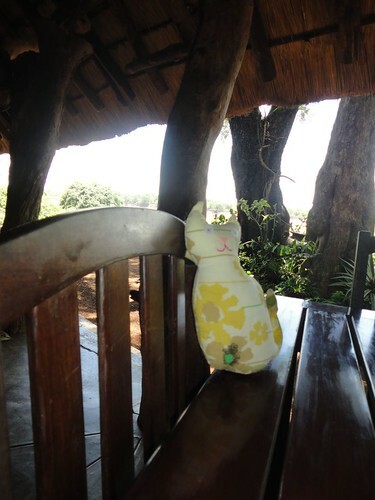 Cat was made by Gorgeous Man’s sister and he had lots of his own adventures on safari. After leaving the lodge we drove back to Livingstone and restocked our food supplies. Then we headed out again. 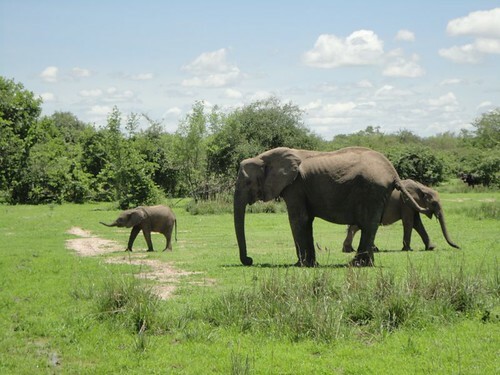 This time we were headed for South Luangwa National Park. 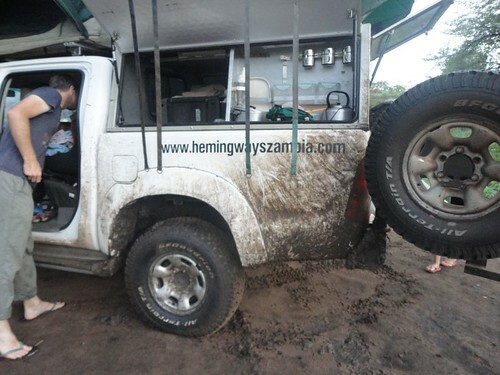 This involved driving to the capital Lusaka and breaking our trip overnight and then heading for South Luangwa the next day. In the morning we happily set the GPS and started driving. After a time we hit the dirt road and it seemed like a pretty good one. It was graded and large enough for traffic to go both ways. After a few hours, however, the road looked like this. The road became large potholes of thick black slippery mud. Every now and then I’d look over at Gorgeous Man and see that his knuckles were white on the steering wheel. 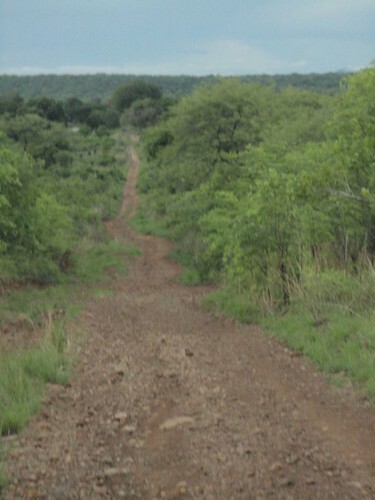 Eventually we realised that the GPS had sent us on a 4wd-only track instead of selecting a tarred road route. However, by this time we had come too far to go back. I have discovered that extreme 4-wheel driving is not for me. I am too anxious. I am also in awe of Gorgeous Man’s driving skills because that road was scary. He claims it is all down to the great vehicle (Toyota Hilux) that we were using. Gorgeous Girl spent most of the time sing “Bumpity Bump!” whenever we hit a particularly rough patch and didn’t really start to get anxious until around dusk. I do need to say that by dusk we had been driving for 10 hours and she had taken the trip like a champion, amusing herself and with very little complaining. As night was falling we came to a river and our hearts sank. The causeway had been washed away. Gorgeous Man got out and poked it with a stick and discovered that the drop was too steep and there was no way that we were going to be able to cross. He reversed the car up the road (it was a hill leading down to the river) until we found a place where he could safely turn around. By this time it was dark and we did not know what we were going to do. We had passed a village a little while before, so we figured we would go there and ask if there was an alternate river crossing. After a while we spotted a teenager and his younger brother and so we rolled down the windows and asked how they were. This is the first thing you do in Zambia – no business gets done before a greeting is exchanged. Then we asked about a river crossing, as we were talking, their father arrived to see what was going on. He told us that we should not keep travelling that night as it was too dangerous and there were elephants about. He told us that we could sleep in the school. He apologised that all the houses in the village were full of people. When Gorgeous Man said that we didn’t need to bother anyone to open the school because we had tents on the cars and could just sleep in them if we could park the car in the school yard, we were invited to set up our tents in the village. While Gorgeous Man and I set up the tents Gorgeous Girl took off with the village children to play and had a wonderful time running around in the dark with her flashlight. The village was basically a family group, the parents and then their grown children and grandchildren living in a collection of houses and huts. 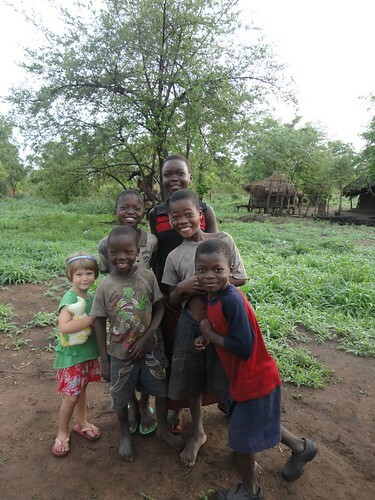 The village had a well, but there was no running water and Gorgeous Girl was introduced to her first pit toilet. She didn’t want to sleep in her own tent this night, so I slept in one tent and she and Gorgeous Man shared the other. When I say slept I use the term loosely, as I spent most of the night worrying about how we were ever going to reach our destination. In the morning we were able to see the car. No longer so clean and white. 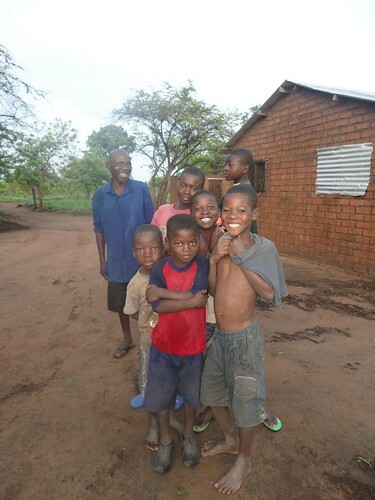 This is our benefactor, the older boy is his child and the younger children are his grandchildren. He worked as a court clerk until he retired and was very proud that he had sent all of his 9 children to high school, even the girls (though they only did up to year 9 from what I could understand). He was very interested in our tents, so I invited him take a look inside. In return I was given a tour of his house. 4 rooms, battery powered light (no electricity) 2 bedrooms, a living room and a store room where their entire harvest of maize is kept. What they harvest has to last them until the next harvest and they grow it themselves. I would have loved a tour of some of the traditional houses that you can see in the background of the following pictures, but I didn’t like to ask. The hut on stilts was for storage, not for people to live in. After taking these photos and expressing our thanks for a safe place to sleep. We took their address so we could send the photos to them once we got to Australia and continued on our way. Two of the older boys came with us to help us find a new place to cross the river, but that is a story for another day (since this post is overly long already). I would not have willingly taken that road had I known how hard it would be. But the error of the GPS lead us to an experience that money cannot purchase. We spent the night in a traditional village and got to meet the local people and for that I am grateful. Unfortunately there was quite a lot of rain while we were at the lodge looking for butterflies and this affected the species count as they don’t like to fly in the wet weather. However, there were a few good days and Gorgeous Man spent some time with his net and traps. Trap sewn by yours truly in the wee hours of the morning the day before the sewing machine was packed on a shipping container. Gorgeous Girl and I found some other things to do. 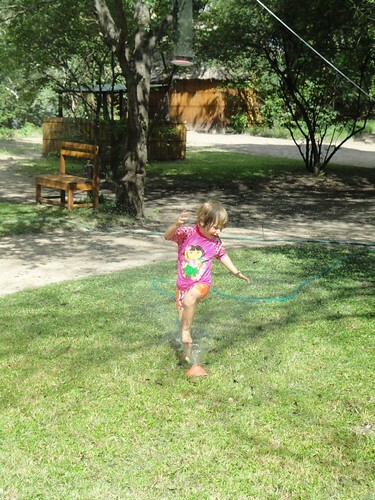 Cooling off under the sprinkler and meeting some of the local wildlife up close. 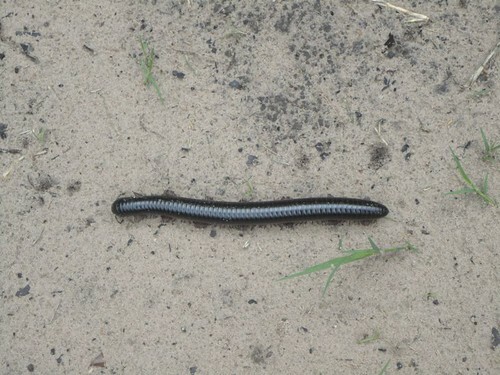 This millipede was as big as my foot (US size 7). It was a big sucker. One of the lovely things about this lodge was the bathroom attached to our room. It was open to the elements. After a few days at the lodge it was time to move on. 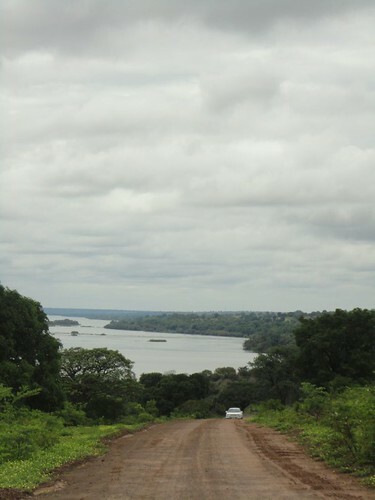 We headed back onto the dirt road that paralleled the Zambezi River. The day started out clear, but in the afternoon when we were on the paved road heading towards Livingstone a rainstorm hit. 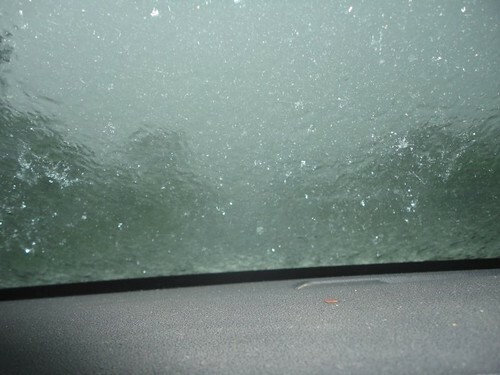 This was the view out of the front windscreen of the car. There was a bus about 10 metres in front of our car. As the road’s shoulder is very narrow it was not safe to pull over – visibility was so poor that we would have been at greater risk of being hit by an vehicle, so we put on our hazard lights and slowed down. The rain was only this heavy for a short time, but it was interesting for a while.